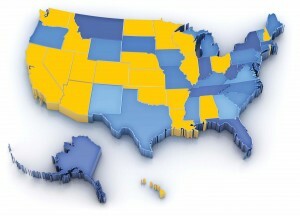 States with no 9-1-1 training requirements are indicated in yellow. Illustration iStock. Updated: Feb. 13, 2013 — West Virginia now requires EMD. Updated: Jan. 2, 2013 — Michigan adopted minimum training standards for 9-1-1 operators on Dec. 13, 2011. Training. In the comm center, it can be the difference between a bad day and saving a life. Both callers and first responders rely on the skills and knowledge of their telecommunicators. Despite the need, there are no national minimum training standards for 9-1-1 telecommunicators. There’s also little consensus on how much training in what subjects is necessary and how—and whether—to fund such training. Each state has taken its own path. This article focuses on states with mandated and voluntary requirements. Since 1996 under state code 18-08-084, Alaska has mandated emergency med­ical dispatch (EMD) certification for public safety telecommunicators who provide pre-arrival instructions to first responders. Recertification is re­quired and should be within the requirements of the agency’s EMD program. Funding isn’t provided by the state. California law does not mandate training for public safety telecommunicators. Training requirements are determined locally. The California Commission on Peace Officer Standards & Training (POST; www.post.ca.gov) offers a voluntary certification for public safety dispatchers. Participating law enforcement agencies agree to abide by POST. These agencies are eligible to receive the commission’s services, such as job-related assessment tools, research into improved officer selection standards, management counseling, the development of new training courses, reimbursement for training and leadership training programs. There are few non-POST agencies in California. Public safety dispatchers are required to complete a POST-certified public safety dispatcher’s basic course before or within 12 months of their date of hire. To be a POST-certified course, a program must have a minimum of 120 hours of training and meet the minimum hours suggested for 14 topics, which include professional orientation and ethics, eight hours; telephone technology and procedures, 14 hours; radio technology and procedures, 12 hours; and critical incidents, 16 hours. To stay in compliance, dispatchers must complete 24 hours of continuing professional training every two years. POST issues the Public Safety Dispatcher Certificate, which is awarded to full-time dispatchers who satisfactorily complete the basic course and a probation period. In 1993, minimum training standards for public safety telecommunicators were established under Connecticut General Statute 29–30. The mandate is administered by the Department of Public Safety (www.ct.gov/dps), Office of Statewide Emergency Telecommunications (OSET) and the Office of Education and Data Management. To become certified, telecommunicators must complete the state’s course, which is 50 hours, and any other training required by their agency. Recertification is required every two years and is met through verified continued employment. EMD certification is also required, and Connecticut accepts the APCO Institute EMD, NAED and PowerPhone programs. Dispatchers must maintain their EMD certification according to their program’s specifications. The only cost to PSAPs for the mandated course is the telecommunicator’s salary. Funding for outside training is reimbursed by an OSET training subsidy, which is ultimately funded by the state’s 9-1-1 surcharge. The fund reimburses for association memberships, conference, training classes and backfill for overtime, as well as the costs of attending outside training and conferences, excluding food. The only required training standard in Delaware is EMD, enacted under the “Establishment of 9-1-1 Emergency Medical Dispatch System,” Delaware Code Title 16, Chapter 100, Section 10006 (http://codes.lp.findlaw.com/decode/16/100/10006). EMS telecommunicators must complete NAED’s 24-hour EMD course. Recertification is required every two years. Telecommunicators must complete 24 hours of continuing education during that time and pass the recertification test. Funding is the agency’s responsibility. Also according to Carrow, that ball is beginning to roll. Some 9-1-1 officials would like to mandate the APCO Institute’s Public Safety Telecommunicator 1 (PST1) course be used by agencies as their basic training and supplemented with agency-specific training. This course meets the APCO P33 guidelines for communications training, which is an American National Standard Institute (ANSI) standard. The Delaware State Police Communications Section recently submitted its in-house training program to APCO and is now P33 certified. On June 3, Florida Gov. Charlie Crist signed into law Senate Bill 742 Public Safety Telecommunications/E911, which went into effect July 1 (www.fl-ems.com/dispatchers.html). The law outlines a certification process for all public safety telecommunicators and dispatchers, who must be certified by Oct. 1, 2012. Telecommunicators hired after October 2010 must complete a 232-hour training course approved by the state Department of Education (DOE) and Department of Health (DOH). DOE has defined a 13-point training program of 232 hours and an additional 24 hours for EMD training. DOE has listed acceptable courses online, which include an updated version of the state’s 232-hour course. The law allows agencies to maintain their in-house training programs for certification if they meet DOH parameters. On-the-job training can be included in the 232 hours. Telecommunicators must then pass an exam measuring their competency and proficiency. There’s a $75 examination fee. After completing a course and exam, telecommunicators must submit an application with a $50 fee to DOH. Telecommunicators currently working in Florida have been grandfathered into the certification. Individuals who can document their employment for three years since January 2002 qualify for certification and can submit applications now. But, that certification expires on Oct. 1, 2012, and telecommunicators are expected to complete the recertification process. Individuals employed as a telecommunicator for less than three years must take the state exam. Telecommunicators will be required to renew their certifications every two years. The DOH will establish rules requiring 20 hours of training to qualify for recertification, and there will be a $50 renewal fee. The Florida Department of Health Emergency Medical Services Trust Fund will hold the money collected from the certification process. Certification may be temporarily waived by the geographical area of state in which the governor declares a state of emergency. Under Georgia law (OCGA 35-8-23), training for public safety communications officers is regulated by the Georgia Peace Officer Standard and Training Council (www.gpstc.org). All communications officers must complete the Basic Communications Officer Training Course administered by the Georgia Public Safety Training Center and approved by the POST Council within six months of hire. This 40-hour course includes written and performance-based examinations. It meets NFPA 1061 and qualifies individuals for certification as telecommunicator I and II through the National Professional Qualifications Board. All communications officers working in the field prior to July 1995 were grand­fathered into the requirement. They are considered “registered” rather than “certified” communications officers. The difference in standing occurs when employment ends. If a registered communications officer is not on the job for more than 12 months, they must apply to the POST Council for approval to attend the course and successfully complete the certification process to be rehired. Idaho’s telecommunicators can complete a voluntary certification to become a communications specialists through Idaho’s POST Academy (www.idaho-post.org). The academy offers four levels of training certifications, as well as supervisor, master and management certifications in communications. To complete the basic certification (Level I), telecommunicators must take 80-hours of POST-certified training and have one year of full-time dispatch experience. Recertification is not required. The requirements are overseen by the Indiana Emergency Medical Services Commission. The certification is actually for the EMD agency, which must use a curriculum that meets the commission’s standards and pay a fee. Courses offered by the APCO Institute, the National Emergency Number Association and National Highway Traffic Safety Administration have been approved by the commission. The certification must be renewed at least every two years by meeting the standards of the commission and paying a recertification fee. The commission also reserves the right to request periodic agency reports. Agencies must also report to the commission when an action occurs that could justify the certificate’s revocation or suspension. Since 1998, Iowa’s telecommunicators have been required to complete a 40-hour basic training course approved by the Iowa Law Enforcement Academy (www.state.ia.us/ilea) per Iowa Code 80B. To stay in compliance, telecommunicators must complete eight hours of annual in-service training. This training is required by all communications disciplines. According to Nancy Brady, telecommunicator training coordinator at the academy, a telecommunicator is defined as an individual who receives or dispatches requests to emergency response agencies, which includes, but is not limited to, law enforcement, fire rescue and EMS agencies. Kentucky Revised Statute 15.530 through 15.590 require any individual employed full-time to dispatch law enforcement via radio communications for a criminal justice information service (CJIS) agency to complete a minimum of 160 hours of training within six months of hire. The Kentucky Department of Criminal Justice and Training (http://docjt.ky.gov) offers a Telecommunications Academy to meet these requirements. The basic course is 175 hours and designed for new hires that will have full access to CJIS databases at their agencies. During the length of the course, which is four weeks and three days, telecommunicators learn calltaking basics and spend one week devoted to CJIS and the Law Information Network Kentucky/NCIC. To stay in compliance, telecommunicators are required to complete eight hours of in-service training from the department annually. All full-time public safety dispatchers hired after January 2008 in Maine must complete the NAED Emergency Telecommunicator Course for certification within 12 months of hire. The state’s Emergency Services Communications Bureau (www.maine911.com) dictates basic and in-service training and certification. Dispatchers must also complete a 16-hour PSAP equipment certification class. Recertification is required every two years and includes 24 hours of continuing education. This certification is mandatory for all full-time dispatchers working for state approved primary and secondary PSAPs. There is no mandate for part-time staff, but they are strongly encouraged to participate in the training and certification program. The Access Integrity Unit of the Maine State Police dictates training and certification for NCIC/Nlets and in-state teletype systems. Law enforcement dispatchers must complete a 40-hour NCIC/Nlets Terminal Operator Course. Every two years, telecommunicators must complete the four-hour recertification course. Effective January 2007, all dispatchers working in a state-approved PSAP must be EMD certified. EMD is optional for non-PSAPs, and funding isn’t provided for them. The NAED Medical Priority EMD Certification Course is the state’s standard, as designated in the Maine Emergency Medical Services Act—EMD Mandatory Qualification. Recertification is required every two years and includes 24 hours of continuing education in that time. Funding for these mandates is provided by the 9-1-1 phone surcharge. Additionally, these monies fund EMD QA training, software and training on use of ProQA and AQUA software, the EMD protocol card sets and the NAED DVD training series for all state approved EMD centers. Under Maryland law (COMAR 12-1-03-10), PSAPs must train new telecommunicators within six months of hire using a curriculum approved by the state Emergency Number Systems Board (www.dpscs.state.md.us/ensb). The law designates topics for an approved curriculum, such as PSAP orientation, communication skills, electronic systems, policies and procedures, call processing, documentation, stress management, administrative duties and disaster and major incident training. Telecommunicators receiving and dispatching EMS calls must be licensed under COMAR 30-02-02-03. In addition to basic training, EMD telecommunicators must have 2,000 hours of public safety calltaking or allocating experience, must successfully complete an EMD program approved by the state EMS Board and the program’s exam. Telecommunicators must then score at least 75% on an EMD written licensure exam administered by Maryland Institute for Emergency Medical Services Systems. EMD telecommunicators must maintain CPR certification. Telecommunicators in Massachusetts must complete the Enhanced 9-1-1 training course offered by the State 9-1-1 Department (www.mass.gov). The 16-hour training covers the E9-1-1 system’s basic operations. The department periodically offers a one-day refresher training. The mandatory E9-1-1 training is funded by the state and free for all PSAPs. In July 2008, the state legislature approved Chapter 223 of the Acts of 2008, which established the State 9-1-1 Department, a single 9-1-1 surcharge and an E9-1-1 fund. The State 9-1-1 Department offers education through its Training Academy, a five-week PSAP Academy that uses the APCO Institute’s 40-hour PSTI course and is overseen by the Massachusetts Statewide Emergency Telecommunications Board. Telecommunicators are encouraged to seek continuing education, and the department has compiled a list of accepted courses, which includes APCO Institute courses. Other accepted training sources include PowerPhone Inc., Profile Evaluations Inc., NAED, National Center for Missing & Exploited Children, The Public Safety Group and Fred Pryor Seminar. EMD is mandatory for all PSAPs in Massachusetts, but it has been unfunded. As of fiscal year 2011, funding for EMD training will be made available. On May 25, 2010, during the 10th Annual Missing Children’s Day Ceremony, the Massachusetts Executive Office of Public Safety and Security announced newly developed standards for 9-1-1 telecommunicators for handling calls pertaining to missing and exploited children. Representatives from Massachusetts State Police Communications Section, the State 9-1-1 Department, the Boston Police 9-1-1 Department, the Commonwealth Fusion Center, the Massachusetts Missing Children Clearinghouse, the Massachusetts Police Chiefs Association and the Massachusetts District Attorneys Association developed the standards. Massachusetts is the first state to develop its own policy based on the ANSI guidelines and commit to training every telecommunicator in the state. According to the National Center for Missing and Exploited Children (NCMEC), it is the most comprehensive implementation effort yet and sets the benchmark for the country. On Dec. 21, 2007, Michigan Gov. Jennifer Mulhern Granholm signed Public Act of 165.2007 into law. The act gave the Michigan Public Service Committee (MPSC; www.michigan.gov/mpsc) rulemaking authority over public safety telecommuicator training standards based on recommendations from the State 9-1-1 Committee (www.michigan.org/snc). The State 9-1-1 Committee worked for a year and a half developing its recommendations and establishing the program for implementation. There have been multiple comment periods and drafts. What is expected to be the final draft of the standards was recently submitted to the MPSC. After MPSC passes the final version of the training standards, telecommuicators currently working in the state will have two years to comply. “The 9-1-1 community knows it’s coming,” says Miller-Brown. The standards, as currently drafted, outline the requirements for telecommuniators to become state “designated telecommunicators.” Initial training consists of 80 hours. The first 40 hours must be completed within 18 months of the rules going into effect or the hire date for a new telecommuicator and consist of a 40-hour approved basic course. The course must include a public safety overview, telecommunicator roles and responsibilities, legal aspects of dispatch services, interpersonal communications, public safety technologies, which includes fire dispatch, telephone techniques, call classification, radio communications and stress management. Within 24 months of the rules going into effect or their hire date, telecommunicators must complete the second 40-hour set of training. This set consists of eight hours on each of the following: domestic violence, suicide intervention, 9-1-1 liability, stress management and homeland security. Continuing education will be required and consists of 24 hours every two years. A maximum of eight hours can be internal training, and the remaining 16 hours must be other approved training. A list of more than 200 approved courses is online. Providers include the APCO Institute, Oakland Police Academy, Power­Phone Inc., the Public Safety Group and NENA. Although many comm centers have their own training budgets, the state has funded training since 2001. Approximately 6% of the state’s 9-1-1 surcharge goes directly to PSAPs for training approved by the State 9-1-1 Committee. The funds are distributed between the PSAPs twice a year based on the number of telecommunicators employed. The funding can also be used for travel and lodging, wages for the telecommunicator attending an approved training and overtime for either the replacement telecommunicator or the trainee. In Mississippi, since 1993, if you spend eight hours or more in a 30-day period on the comm center floor, you are required by State Code 19-5-353 to be certified as a telecommunicator. The state Department of Public Safety, Division of Public Safety Planning, Office of Standards and Training (www.dps.state.ms.us) oversees the requirements. Certification begins with one of the three approved 40-hour basic communications courses (APCO, NAED or NECI of Atlanta). The course must be completed successfully, and its certificate must be submitted with the state application for certification. Step two in the certification process is to complete an eight-hour field observation. In urban areas, these eight hours may entail a traditional ride-a-long, but a majority of the state is rural. If a telecommunicator is not actively engrossed in a response, they are encouraged to learn about the apparatus. An essay must then be composed about their experience, what they learned and what is available at the station for emergency personnel and service. EMS telecommunicators must complete an approved 24-hour EMD course, which includes APCO Institute, NAED and NECI programs, and be CPR certified. After the training application is submitted and a background investigation is completed, the certification issued is valid for three years. During that time, certified telecommunicators must complete 48 hours of continuing education on a minimum of six different topics. A list of courses is available online. Not all 48 hours can be online courses. The department encourages telecommunicators to get out of the comm center and learn in the classroom or conference setting, as well as online. For the first recertification cycle, telecommunicators must also take the 16-hour state recertification course. This course is designed to touch on such topics as officer down calls, AMBER alerts and suicide calls that telecommunicators may not have handled during their time on the job. Funding for the certification, continuing education and recertification comes from a five-cent tariff on all state phone lines. As a result, everything is paid for. Agencies are reimbursed tuition for telecommunicators who complete their certification and recertification. Reimbursement is also available for approved outside training. Missouri Statute Chap. 650-340, known as the 9-1-1 Training and Standards Act (www.sema.dps.mo.gov/911), has designated training for public safety telecommunicators since 1999. The initial training requirement for all law enforcement, fire and EMS telecommunicators is 16 hours. 9-1-1 telecommunicators at joint comm centers must complete 40 total hours of training. Law enforcement, fire and EMS telecommunicators can complete an approved 40-hour course and still be in compliance. All initial training must be completed within 12 months of employment. After initial training, all telecommuni­cators are required to complete 24 hours of ongoing training every three years. The state’s Department of Public Safety issues the certification and determines which organizations are authorized to conduct training. A list of approved training courses, which includes APCO Institute courses, as well as courses offered by the University of Central Missouri Safety Center, Chariton Co. Enhanced 9-1-1 Service, The Public Safety Group, NAED and NECI, is available online. EMD certification is mandated by the state’s Department of Health and Senior Services in Missouri Statute Chapter 190. According to the law, telecommunicators must successfully complete an EMD program that meets or exceeds the U.S. Department of Transportation’s curriculum. In Montana, under law 7-31-202 (www.doj.mt.gov/enforcement/training), all public safety communications officers must complete the Public Safety Communicator Basic Course offered by the Montana Law Enforcement Academy. This 40-hour, one week course covers law enforcement, fire and EMS disciplines and is offered four times a year. Topics include effective communications, incident documentation and radio and phone procedures. Individuals must also be certified by the Criminal Justice Information Network (CJIN) Service Section to operate CJIN computer terminals. CJIN courses are conducted online and accessible from the host agency’s CJIN terminal. POST oversees training under state law 7-31-203. Funding is not available from the state. Agencies are responsible for tuition. In 1993 under RSA 106-H, the state legislature established the State Enhanced 9-1-1 Commission and the Bureau of Emergency Communications, which oversees training for New Hampshire’s 9-1-1 telecommunicators. The legislation also established a surcharge to fund all aspects of the statewide 9-1-1 system, including training. All 9-1-1 calls placed in New Hampshire are routed by trunks to PSAPs in Concord or Laconia. The system is designed to roll over between the PSAPs, meaning a call automatically routes to the telecommunicator who has been available for the longest time and if there’s an outage at one PSAP, it will be invisible to the public. As a result, basic training is extensive and includes all public safety disciplines. All new employees complete eight weeks (320 hours) of classroom training followed by eight weeks (320 hours) of hands-on training at a console with an APCO-certified communications training officer/supervisor. Topics discussed in the classroom include active listening, EMD, mapping, NIMS, customer service, behavioral emergencies, suicide, and police, fire and EMS call­taking. But it’s not all bookwork. Representatives from various agencies, including N.H. Fish and Game, the New England Poison Control Center, Marine Patrol and N.H. State Police, participate in the educational process. During the classroom training, trainees complete the APCO certification for Public Safety Telecommunicator (PST1); NAED’s EMD program, which is 24 hours of training and an exam; and CPR certification. EMD recertification is required every two years. CPR recertification is also required every two years and includes a four-hour course and exam. At both PSAPs, continuing education is offered every month in the form of one- to two-hour sessions — in the past, as many as eight training sessions have been offered, as often as twice a month. Most continuing education is not mandatory, and training is conducted while telecommunicators are on duty. The shift change is designed with 3.5 hours of overlap, allowing the operations floor to remain staffed during the sessions. Dispatch: Although state-mandated training is only for 9-1-1 telecommunicators, the Bureau of Emergency Communications has not forgotten about the dispatchers and first responders at local agencies. Eighty-eight public safety agencies can receive information from the state’s CAD system. When a telecommunicator transfers a call to a dispatcher, both the 9-1-1 caller and telecommunicator are transferred, allowing the telecommunicator to relay concise information and ensuring a complete call transfer. What’s next: Communications training is evolving. At press time, four telecommunicator trainees at the agency were participating in a pilot study that brings trainees to the console sooner than at eight weeks. After spending only three weeks in the classroom, the trainees began observing and working with trainers on the operations floor once a week. This teaching technique is designed to reinforce what has been taught in the classroom. Since 1990, public safety telecommunicators in New Jersey are required to complete a 40-hour basic communications course for certification through the state’s Office of Emergency Telecommunications Services (OETS; www.nj.gov/911/resource). This training is required for telecommunicators serving any public safety discipline from a primary PSAP. Telecommunicators responsible for EMD must also complete an eight-hour CPR certification and a 32-hour EMD course. For secondary PSAPs, the level of training is dictated by the hiring agency. All telecommunicators in secondary PSAPs taking calls for or dispatching EMS are required to maintain EMD and CPR certifications. These rules were enacted under the State Administrative Code 14-24 as part of the legislation for the 9-1-1 emergency telecommunications system. The laws do not designate programs for the basic communications course, EMD program or CPR. For basic training, a program must include specific topic areas, such as interpersonal communications; overview of police, fire and EMS functions; radio broadcasting rules and procedures; and telephone techniques. Programs must meet the law’s standards, and recertification is not required. After their initial certification, telecommunicators must complete eight hours of annual in-service training developed by the local PSAP and approved by OETS to address annual technical developments and improve 9-1-1 services. The law requires that EMD certification programs use guidecards that are approved by the state’s Department of Health and Senior Services, meet ASTM Standard F1552 and follow the NHTSTA EMD National Standard Curriculum. Certification must be maintained. Accepted courses are offered by the APCO Institute and NAED for both basic training and EMD. Funding for training is not provided by the state. But OETS offers in-service training at no cost. Within 12 months of employment, all telecommunicators must be certified by the New Mexico Department of Public Safety Training and Recruiting Division (www.dps.nm.org/training). Minimum training standards were enacted under state Administrative Code 10-29-10, the Public Safety Telecommunicator Training Act. Telecommunicators must complete basic training from the New Mexico Law Enforcement Training Academy’s Public Safety Telecommunicator Program or an accredited satellite or regional academy. Minimum training consists of 118 hours of instruction on 10 topics, including NCIC and state telecommunications systems, 13 hours; call handling processes and procedures, 19 hours; radio technology and guidelines, four hours; scene management, 13 hours; and human relations, 5.5 hours. Under state administrative code 7-27-10-20, EMD is required for telecommunicators whose agencies receive and dispatch EMS services. Telecommunicators must complete 24 hours of additional EMD certification from an approved program. After successfully completing basic training, telecommunicators can take the public safety telecommunicator certification exam within one year of completing the training. To maintain their certifications, telecommunicators must successfully complete 10 hours of approved in-service training annually. Public safety telecommunicators are required to complete the Emergency Services Dispatch Training Evaluation Program and pass the final examination under New York state law 21 NYCRR Part 5201. The state Office of Fire Prevention and Control (www.dos.state.ny.us/fire/firewww.html) determines the minimum standards. The law outlines the basic course of study, which includes roles and responsibilities, legal aspects, interpersonal communications, telephone techniques, call classifications, radio communications, stress management and technology. Telecommunicators must also learn about the Incident Command System, which includes the ICS 100 and ICS 700 courses offered by the New York State Emergency Management Office. Training must be completed within 12 months of hire. Approved courses include the APCO Institute Basic Telecommunicator Course, NAED Emergency Telecommunicator and the New York State Municipal Police Training Council’s Public Safety Telecommunicator’s Course. Recertification is not required. To stay in compliance, telecommunicators must complete 21 hours of annual in-service training. Telecommunicators are also required to have EMD training that meets or exceeds the standards established by the National Highway Traffic Safety Administration. Telecommunicators must maintain their certifications according to their specific program’s recertification process. At this time, New York is restructuring several offices under the umbrella of Homeland Security, including 9-1-1. In 1998, North Carolina passed mandatory training requirements for law enforcement telecommunicators. Under Administrative Code Title 12-10B, the mandate is governed by the state’s Sheriff’s Training and Standards Commission. The 47-hour Telecommunicator Training Certification Course is mandatory for all telecommunicators working under the direction of a sheriff. The training is facilitated through the North Carolina Justice Academy (http://ncja.ncdoj.gov/NCJAHome.aspx), which wrote the curriculum, and the state’s community college system. To stay in compliance, telecommunicators must complete 16 hours of in-service training annually. Topics for in-service training change every year, but telecommunicators must take any deemed mandatory as part of their 16 hours. According to North Carolina APCO Chapter President Jeryl Lynn Brown, certification is optional for agencies not under the direction of a sheriff. The course is free. Funding comes from the state’s general assembly. North Carolina Justice Academy and the community colleges track the number of students trained annually and receive the funding. On Feb. 4, 2003, the North Dakota legislature passed NDCC 57-40 for Emergency Services Communication Systems (www.legis.nd.gov/cencode/t57c406.pdf). The law became effective on July 1, 2005, and established minimum training requirements for “9-1-1 dispatchers,” as well as the N.D. Emergency Services Communication System Advisory Committee. Credentialing for EMD instructors involves a 40-hour basic telecommunications course, successful completion and certification through an EMD program, successful completion and certification as an EMS instructor or completion of the state’s Methods of Instruction course, and certification as a N.D. first responder. All programs and their equivalents are determined by the agency. To fund the 9-1-1 system, the law established a $1 fee for every landline, wireless and VoIP phone in the state. Although most agencies use these funds for infrastructure, such as new radios, phones or system upgrades, they can be used for training and related travel. Ohio does not have mandated training standards, but it does have recommended standards for certification under state law 4742 (http://codes.ohio.gov/orc/4742), which became effective in November 1997. According to the law, “emergency service telecommunicators” are encouraged to complete a minimum of 40 hours of instruction on such topics as effective communications skills; telephone techniques; law, fire and EMS terminology; radio discipline; disaster planning and responder safety. Career schools or colleges can submit their course curriculums to the state board of education, which approves or rejects courses according to the recommended training. For recertification, telecommunicators must complete eight hours of continuing education every two years. The law established a fund for training certification in the state treasury. The state Board of Education distributes money from the fund. Individuals in Oregon are required to complete 80 hours of basic training through the Department of Public Safety Standards and Training (DPSST; www.oregon.gov/DPSST) to become certified as a public safety telecommunicator under state Administrative Rules, Division 8. The DPSST course, called the Basic Telecommunicator Academy, includes ethics, law enforcement overview, stress management, responder safety, interpersonal communications, TDD, courtroom testimony and a fire/EMS service overview. EMD is also mandated. Telecommunicators must complete the 16-hour Emergency Medical Dispatch Academy, for a total of 96 hours of basic training. Additionally, each telecommunicator must complete a field training manual with their agency’s communications training officer. The manual covers 235 hours of hands-on training. Recertification is mandatory and annual. Telecommunicators must complete 12 hours of continuing education, in-service training and a review of policies and procedures. For EMD, telecommunicators must complete four hours of continuing education, in-service training and a review of policies and procedures. Funding is not provided by the state. Dispatchers must complete additional classroom and hands-on training hours specific to the public safety disciples they serve: law enforcement dispatchers, 32 hours; fire dispatchers, 16; and EMS dispatchers, 16 hours. The law also includes requirements for emergency management agency dispatchers, who must complete the 104 hours of basic training and an additional 16 hours of emergency management specific classroom and hands-on training. Supervisors must complete 224 hours of training, which includes all the training hours listed above and an additional 40 hours of supervisor training. Testing for certification and recertification is done through PEMA. All dispatchers must complete the recertification test every three years. Supervisors must complete testing every four years. EMD recertification is required every two years, with a minimum of 24 hours of continuing education completed during that time. Telecommunicators must also pass the recertification tests for their agency’s EMD program, typically the APCO Institute EMD or NAED programs. Funding for training comes from the state’s telephone and wireless surcharge. Under South Carolina Code 23.47.20, the South Carolina Criminal Justice Academy (www.sccja.sc.gov) is responsible for administering training for the state’s 9-1-1 dispatchers. APCO Education and Training Administrator Sheila Hanna-Wiles says, “[South Carolina] has always had a 40-hour mandatory training, but currently, within the last two years, it changed to an 80-hour course with a new outline.” The course, Basic Telecommunications/9-1-1 Training, became a two-week, 80-hour course as of July 2009. Recertification is not mandatory. Each agency is responsible for the cost of tuition for the academy, which is $350 per student and covers meals, dormitory rooms, class materials and instruction. In February 2008, South Dakota Gov. M. Michael Rounds signed into law an act regarding the collection and administration of the 9-1-1 emergency surcharge and operation of 9-1-1 services. The act updates SDCL 34-45, which formed the South Dakota 9-1-1 Coordination Board and gave it rulemaking authority to set standards for PSAP operations. SDCL 34-45, which was originally enacted in 1999, included training certification for 9-1-1 telecommunicators mandated by the Law Enforcement Officers Standards Committee (http://dps.sd.gov/emergency_services/emergency_management/sd_911.aspx). All telecommunicators must complete the 80-hour course from South Dakota Law Enforcement Training Center. Topics for this two-week course include ethics, responder safety, liability and NCIC. The board requires EMD training for EMS telecommunicators, but it does not designate a program. Individual PSAPs determine their EMD program, and training hours and recertification requirements are in accordance with that program. The law also established a training fund. Funding is generated by an assessment of $1 from every law enforcement citation issued. The monies are continuously appropriated and distributed by the state’s Division of Criminal Investigation. The Tennessee Emergency Communications Board (TECB; http://tn.gov/commerce/911/index.shtml) implements training for public safety communications personnel. Minimum training and course requirements are defined under Tenn. Code Ann. 7-86-205a. All individuals who receive an initial or transferred 9-1-1 call from the public must complete 40 hours of coursework and 40 hours of supervised on-the-job training. The code defines the minimum number of hours for specific topics including interpersonal communications (five), technology (four), communications techniques (11), radio communications and dispatch techniques (12). TECB Executive Director Lynn Questell says, “This is a minimum standard, which employers are encouraged to exceed.” For recertification, telecommunicators must complete a minimum of eight hours of continuing education every two years. Training is funded by TECB through an annual dispatcher training supplement based on the number of dispatching and/or calltaking positions in each of the state’s 100 emergency communications districts. The Texas 9-1-1 Trainers Forum (TNT) is proposing revisions to training standards for telecommunicators. The current law (Occupation Code 1701), enacted in 2001, requires all telecommunicators to take a 40-hour basic telecommunicator certification course through the Texas Commission on Law Enforcement Officers Standard Education (TCLEOSE; www.tcleose.state.tx.us) within their first year of employment. TCLEOSE accepts other basic courses, such as APCO’s, but the state also developed its own. (Note: The course is expected to begin the revision process this fall.) Although TCLEOSE recommends advanced training, such as crisis communications and TDD/TTY for intermediate and advanced certifications, it isn’t legally mandated. No continuing education or recertification process is required. To take this a step further, the TNT Telecommunicator Hiring and Education Standards steering committee, chaired by Patty Cross, has partnered with the Texas Engineering Services at Texas A&M University to apply for a grant to put the basic training course online. If the grant is approved, the course would be available online for free for the first two years. After that, it would cost approximately $25. The legislation is expected to be introduced in January 2011 through the Texas Legislature’s Licensing and Administrative Committee. Current supporters include the Texas chapters of APCO and NENA and the Texas 9-1-1 Trainers Forum. Utah does not mandate training standards for telecommunicators. Training and certification are determined at the agency level. Currently for public safety dispatching, telecommunicators can complete a 40-hour course that certifies them through POST, which also requires CPR and Bureau of Criminal Identification (BCI) certifcations, along with fingerprinting. BCI certifcation allows telecommunicators to run checks in the state’s databases, and recertification is required every two years. Telecommunicators must complete 20 hours of annual continuing education to remain POST certified. EMD certification is not funded by the state. Most agencies pay for their dispatchers to receive certification and training. Training for telecommunicators is mandated by Vermont Statutes Title 30.3.87, Sections 7051–7061. The statutes give the Vermont E9-1-1 Board responsibility for all aspects of the statewide 9-1-1 system, and funding comes from the state’s Universal Service Fund. Memorandums of understanding (MOUs) are in place between the public safety agencies that run the state’s eight PSAPs. The MOUs call for the board to provide hardware, software, maintenance and training, and the PSAPs agree to require their staffs to become certified and follow the board’s standard operating procedures and call-handling requirements. For the certification, telecommunicators take the Vermont Calltaker Certification course, which consists of 56 hours of classroom instruction, and complete 40–400 hours of on-the-job training. For recertification, calltakers must annually complete 16 hours of continuing education, eight of which include the mandatory Vermont Recertification Course, which is designed to address issues from the previous year. Within 12 months of hire, all Virginia public safety dispatchers must complete 40 hours of classroom instruction and 40 hours of on-the-job training. Statute 9-170, enacted in 1988, establishes minimum training. The state’s Department of Criminal Justice Services provides a course that is administered through its regional training academies. Coursework includes communication, judgment, legal issues, professionalism and on-the-job training. Although the course primarily focuses on law enforcement, regional academies can incorporate fire and EMS dispatching techniques into their curriculums. All on-the-job training is conducted at the local level by the agency hiring the dispatcher. After completing the mandatory 40 hours, paperwork must be completed and sent to the state to show compliance. The statute does not require continuing education or in-service training. Continuing education is voluntary and conducted at the agency level. Funding for training is not provided by the state. The Virginia Wireless Services Board reimburses for some training costs based on the percentage of wireless calls answered locally. The Washington State Criminal Justice Training Commission (https://fortress.wa.gov/cjtc/www) offers courses that meet certification requirements. Telecommunicators for 9-1-1, fire and law enforcement are encouraged to complete the 40-hour course, Telecommunicator I-Basic Call Receiver, and a biannual recertification of 24 hours of verified in-service or continuing education. Dispatchers for law enforcement and fire are encouraged to complete a 40-hour course called Telecommunicator II-Law Enforcement & Fire Dispatcher and have the same recertification requirements. There’s currently no EMD state mandate. The commission recognizes the 32-hour basic EMD course from King County EMS, called the Criteria Based Dispatcher course. The prerequisite for this course is an eight-hour online anatomy and physiology class. Recertification is required through the agency and includes 12 hours of medical continuing education per year. Individuals must complete the course and test every two years to maintain this voluntary certification. For communications training officers (CTOs), the commission offers a 32-hour CTO course, which results in a certificate on the successful completion of the course and final exam. In 1994, West Virginia passed a training mandate. Under State Code 24-6-5 (www.legis.state.wv.us), all public safety telecommunicators are required to complete a 40-hour basic training course from an accredited agency within one year of hire. All dispatchers that were employed at the time were given one year to complete a similar course to remain employed. There is no state funding for training. According to Wyoming Statute 9-1-708, a basic 67-hour communications course is mandated for public safety communications officers. The course is offered by the Wyoming Law Enforcement Academy (www.wleacademy.com), and the training standards are set by the Wyoming Peace Officer and Training Commission. Individuals must complete the training within two years of hire. The curriculum topics include telephone and radio procedures with mock calls and dispatches, strategies for responding to emotional situations and administrative tasks. Recertification is required every two years and includes 20 hours of POST-approved training. Training for EMD and fire is not specifically included in the law. Use of EMD is an individual agency decision. Some agencies, such as the Wyoming Highway Patrol, maintain their own training programs, which must meet the standards. Natasha Yetman is the PSC associate editor. Contact her at [email protected]. Special thanks to the EAC, particularly Chuck Taylor, Debbie Smith and Debby Peterson, as well as Bill Carrow, Sherry Decker, Gail Larsen, Harriet Miller-Brown, Charlene Fisk, Alan Gray and Sue Crimmins, for their assistance. Note: Despite repeated attempts, we were unable to obtain information for all states and territories. If you have additional information, contact the editors at [email protected]. Originally published in Public Safety Communications, 76(9):28-37, September 2010.